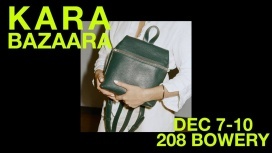 Take great deals on your holiday shopping at KARA BAZAARA. The sale will feature discounts on fashion items, lifestyle products, and home decor. Included brands are AGMES, Cold Picnic, Areaware, Sandy Liang, Risa Nishimori, and Troy Yoshimoto.